King County monitors the ecological health of Crisp Creek in a variety of ways, including collecting and analyzing water, sediment, and benthic invertebrate samples. Station 0321 is located at the mouth of the creek at the bridge on Southeast Green Valley Road, west of 212th Place SE. Water quality samples were collected monthly at this station from 1972 to 2008 when budget cutbacks forced King County to reduce the breadth of its water quality monitoring program. Sampling at this station resumed in February 2013. In 1993, the County began collecting water quality samples at an additional site on Crisp Creek (F321) located upstream of the hatchery inflow near SE 348th and 215th Avenue SE. Sampling at this station was discontinued in 2008 due to the aforementioned budget issues, but resumed in February 2013. In 2017, the Upper Crisp Creek station was moved upstream roughly 100 feet due to construction in the area, and was renamed FF321. Beginning in 1987, sediment quality samples have been collected from Crisp Creek. King County began collecting benthic macroinvertebrate samples in Crisp Creek in 2002. From time to time, additional studies have been conducted on Crisp Creek. Click here for more information about Special Studies. The Crisp Creek watershed is located in South King County between the Cities of Black Diamond and Maple Valley and drains roughly 3,200 acres. The creek originates from several groundwater springs, including Keta Creek Springs and a 20-acre bog approximately 600 feet in elevation (Kerwin and Nelson, 2000; Muckleshoot Indian Tribe, March 1992). The creek runs for a total of three miles from the natural plateau, over the topographic break, and then parallel to the Green River before entering it at river mile (RM) 40.1. Two lakes, Horseshoe Lake and Keevies Lake, are located within the Crisp Creek basin. Total land use in the basin is mostly forest, followed by developed and scrub. Mixed forest and low intensity/open space development are the most prevalent types of forest and developed land. Wetlands and agriculture use considerably less land; and other (barren land, grassland, and open water) contribute even less. See Table 1 below for more details on land use. Crisp Creek provides spawning and rearing habitat for coho, chinook, chum and winter steelhead (Kerwin and Nelson, 2000). Crisp Creek serves as the water supply for the Keta Creek Hatchery (operated by the Muckleshoot Indian Tribe) and two former Washington Department of Fish and Wildlife rearing ponds located at approximately RM 1.05. The hatchery rears and releases chum, coho, Chinook, and winter steelhead (released off-station). State water quality standards were revised in 2003. Crisp Creek is now designated “Core Summer Salmonid Habitat” for aquatic life use, and “Primary Contact” for recreational use. As part of the updated water quality standards Crisp Creek has been assigned an additional “Supplemental Spawning and Incubation Protection” temperature criteria of 13 ºC to be applied from September 15th to July 1st. 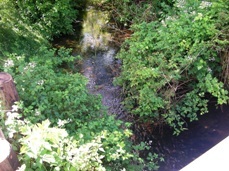 The creek is on the Washington State Department of Ecology’s (Ecology) 303(d) list for violation of bioassessment and DO standards (Category 5). A 25-year (1979 - 2004) trend analysis was conducted with water quality data from station 0321 in Crisp Creek. Results indicated that water quality might have declined over this 25-year period with significant increases in water turbidity, ortho-phosphorus and FC bacteria. Decreased nitrate and total nitrogen concentrations indicate there may be some improvements in water quality in the same 25-year period. A Water Quality Index (WQI) rating system was developed by Ecology that evaluates several water quality parameters and gives and overall rating of "high", "moderate", or "low" concern. To see how Crisp Creek ratings compare with other stream sites, please visit the Water Quality Index webpage. Sediment data were collected from Crisp Creek as part of the Stream Monitoring Program starting in 1987. Data were compiled and analyzed for the years 1987 through 2002. Data were analyzed for trends, correlations, and were compared to sediment quality guidelines. No significant trends were identified during data analysis for any of the parameters tested. Results indicate that Crisp Creek sediments did not exceed any sediment quality guidelines. Of the 27 streams monitored in King County, Crisp Creek was in the middle with the 13th highest metals concentration. Benthic macroinvertebrates are small animals visible to the naked eye (macro) that lack a backbone (invertebrate) and live in or around the streambed (benthic). This group includes aquatic insects (such as mayflies and dragonflies), crustaceans, clams, snails, and worms. Benthic macroinvertebrates are of interest to scientists and water resource managers because they are an excellent indicator of the biological health of stream ecosystems and are a critical component of the food web in aquatic communities. Scientists quantify the composition and diversity of benthic macroinvertebrate populations in a stream to compare the biologic integrity of different streams. King County has utilized benthic macroinvertebrate sampling to assess biological health of numerous creeks across the county (see map). For more information about benthic macroinvertebrates and King County’s Benthic Macroinvertebrate Program, please visit the King County Stream Bug Monitoring webpage. To see the benthic macroinvertebrate data for Crisp Creek, please visit the Puget Sound Stream Benthos webpage. Do chemically contaminated river estuaries in Puget Sound (Washington, USA) affect the survival rate of hatchery-reared Chinook salmon? This study analyzed the survival rate of Puget Sound Chinook salmon released from 20 hatcheries to 14 local estuaries (contaminated and uncontaminated). An analysis for coho salmon was also included. When compared to uncontaminated estuaries, juvenile Chinook survival in contaminated estuaries was 45% lower. Results for coho found no substantial differences in estuaries. In 2001, King County initiated a separate comprehensive study of the Green-Duwamish Watershed, called the Green-Duwamish Watershed Water Quality Assessment (GDWQA). Several reports evaluate data collected as part of the GDWQA. Crisp Creek is included in this analysis.